Library fines are just a part of my everyday business as a librarian. Why do libraries have them in the first place? Really, the main reason is to give library patrons a gentle nudge to bring their books back. Without that pesky little fee, I think a lot of our patrons would honestly mean to bring back a book, "soon" and somehow, with one thing and another and everyone's busy schedules, "soon" would somehow never come. Ultimately, we want the library materials back so that other members can use and enjoy them. Even I've been known to rack up the occasional late fee. The few times a year that it happens, I usually sigh with annoyance at myself and then I'll just matter-of-factly pay it. When you use the library a lot, it's bound to happen now and then, even if you're careful. Generally, this patron will approach the circulation desk, sweating bullets and looking nervous. They may whisper dramatically, and will let you know that they have a serious confession to make. It's a Big Deal... They owe a fine! Looking up his or her record, I announce, "Okay, Ma'am/Sir, it looks like you owe... THIRTY-FIVE CENTS!" The patron will gasp with alarm, and throw a few quarters your way, perhaps even encouraging you to keep the change as a donation, as they quietly slink out of the library in utter shame. These folks always crack me up. They take their library fines very seriously! I promise never to bring back anything late ever again! This is an interesting phenomenon, and I don't really fully understand the psychology behind it. Let's say that your library system will block someone's card, not allowing them to check out more books, or reserve an item, etc. etc. once they owe more than $10.00. This kind of patron will generally owe about $9.95 at all times. They may even owe $9.99! They are very cautious about keeping their library card in good standing. If they return something a little bit late, they may argue very hard with the librarian to try and get their fine removed, or they may pay juuuust exactly enough so that they can check out items again. Frequently, they'll pay with a twenty dollar bill, but if I ask if they'd like to pay down the whole amount, they'll look horrified. "No way!" They'd only like to pay a dollar (or however much to keep it under ten bucks) and that's it. It's obvious that they are of the opinion that paying off your library fine in full is for chumps! They've got a "right" to have a certain amount of fees racked up without any consequences, and they plan to keep it that way! I like those fines, just the way they are. This is the kind of patron that haunts librarians' nightmares. This patron will stroll up to the check-out counter, just as casual as you please, and hand you their card. "Oh, I'm sorry," you'll say. "It looks like you owe $257.85! There are quite a few late fees on here, as well as a number of books you checked out about two years ago, but never returned, so the computer wants to charge you to replace them." This patron will deny everything. They'll deny that they owe money. They'll deny that they've ever checked out anything in the past. Or perhaps, they'll fix you with a blank quizzical look as if to say, "So, I owe more than $250.00 So what? I wanna check out these DVD's right now." These folks amaze me - how can you rack up these kind of library fines without even caring? I'll never pay up! NEVER! So, dear readers, are you guilty as charged? 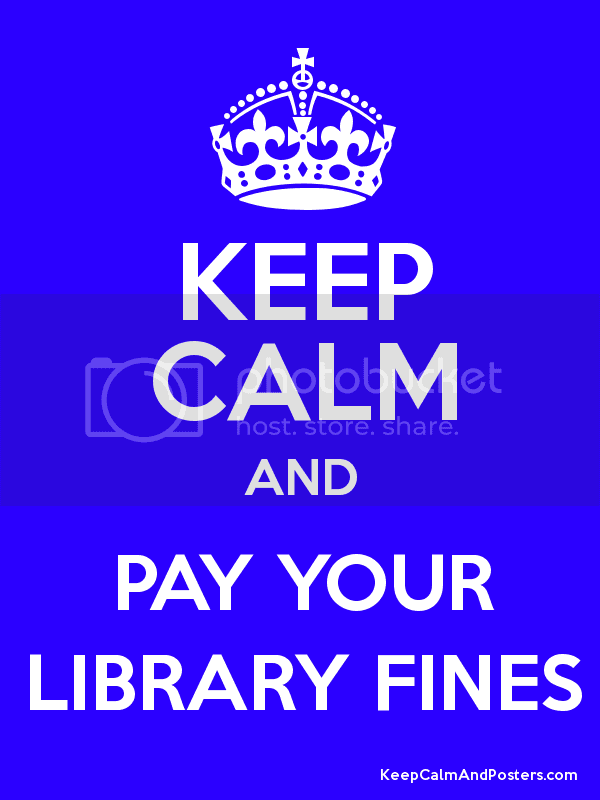 What kind of library fines do you rack up? Do you pay them? Let me know in the comments. We have a lot of patrons who were "in the hospital" when the books were due, some went to jail and accrued fines then. Oh dear. I'm getting quite soft in my old age - I actually am pretty lenient with fines. If someone has a reasonable story, and they're a first time offender I usually let things slide.